NFL referee Gene Steratore during the New Orleans Saints NFC Divisional Playoff game against the Minnesota Vikings at U.S. Bank Stadium. Ever since the Eagles' nailbiting 28-23 victory over the Carolina Panthers on a Thursday night in October, Philadelphia has been on a warpath against referee Pete Morelli and his officiating crew. By all objective measures, it was a horrifically lopsided game. The Eagles drew 10 penalties for 126 yards against one call for one yard against the Panthers. A review of Morelli's history in Eagles games revealed a fairly egregious penalty disparity over the previous four games he'd called: 40 flags for 396 yards against the Eagles to eight flags for 74 yards against everyone else. In true Philadelphia fashion, fans launched a petition to ban Morelli from calling future Eagles games. There are literally still people signing that thing, past 77,000 strong. 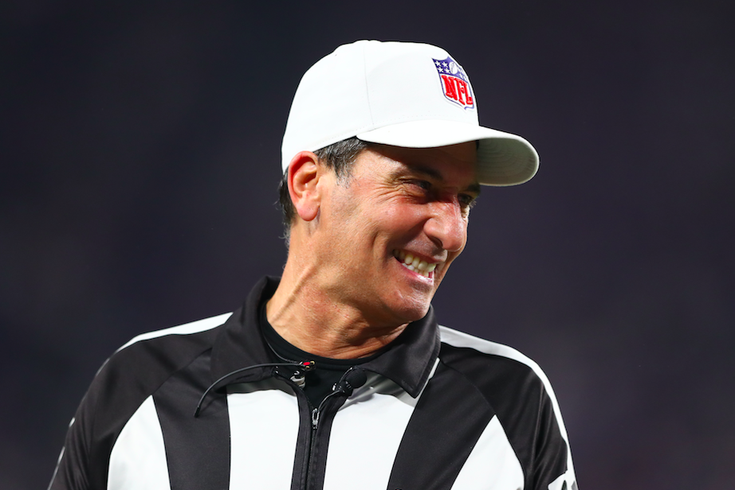 For Super Bowl LII on Sunday night, the NFL awarded the game to Gene Steratore and his officiating crew. As we pointed out last month when the assignment was announced, the Eagles have had a lot of success in games reffed by Steratore. In 13 games going back to 2007, Philly is 10-3. New England is 12-5 with Steratore, but the Patriots have also been much more successful over that entire stretch of time than Philadelphia, as we all know. A new report from ESPN's Sal Paolantonio suggests the Eagles are still doing their homework on Steratore, not for ammo to whine about an imbalance in calls — that's for us to do — but to study his crew's tendencies in order to refine their technique against the Patriots. Players have been shown video cut-ups of their calls, with a focus on pass interference and defensive holding -- especially in the wake of the calls made against the Jaguars that helped the Patriots win the AFC Championship Game. "We kind of use that to understand what they like to call, know what they are looking for, and pretty much just help us play a cleaner game so we know what to expect from them and they know what to expect from us," said Eagles linebacker Nigel Bradham. The focus seems to be on the defensive backfield, where Steratore's crews this season called 43 penalties for defensive pass interference, defensive holding or illegal contact. That was the fifth-highest total in the league. Overall, Steratore's crews averaged 17.1 flags per game, or second-highest in the league. How the Eagles' coaching staff schemes against New England — do they play off-coverage and tempt fate with Tom Brady, or go with more press? — will serve a big role in how defenders play the ball in tight situations. Knowing this crew's tendencies can do nothing but help them put together an effective game plan that respects how strictly the rules of contact and positioning will be enforced. "There's always a fine line in this game between what's valid and what's not," said linebacker Mychal Kendricks, adding that the Eagles will have to assess the way the game is being called as they go. How much scouting has been done on the offensive side of Steratore's crew was not addressed in the ESPN report, but for the Eagles' stout lines, what will and won't be a hold is no less important to get clear for this game. Some fans and others close to the game dismiss concerns about officiating as sour grapes, specifically about the long and soul-crushing reign of the Patriots. Others feel an excess of penalties has long been a big reason the NFL's viewership is in decline. Most of us would probably prefer to see a Super Bowl decided by athleticism rather than rule interpretations, but it was a wise move by the Eagles to use their two-weeks of preparation for a review of the third team on the field.